The Sony PlayStation 4 Dualshock 4 is a very well made controller. It feels solid and has an excellent D-Pad. It has wireless functionality and can charge its internal battery via Micro USB. The simplest way is to plug in with a Micro USB cable. You could probably buy a very long (3M/10ft) USB cable if you wish to sit a bit back from the screen. 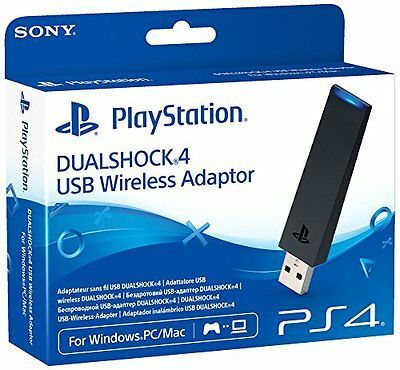 All official PS4 controllers should be able to pair with the official Sony Dualshock 4 USB Wireless Adapter. Both of these adapters by Mayflash are affordable and solid third-party wireless adapters that perform almost exactly the same as the official adapter with the added bonus of being able to use either for other types of controllers as well. However, their method of d-pad input does not work with PPSSPP for PSP emulation. If you wish to use either a USB Bluetooth adapter or the Pi 3's built-in Bluetooth then regular Bluetooth pairing in the menu may work, or you may need to use the userspace controller driver called ds4drv. It depends on your individual controller. To put the controller into pairing mode, press and hold the Share button then the PS button. After a few seconds, the light bar will strobe rapidly and brightly. The controller is now in pairing mode. The controller will not sleep on its own if left idle, it will remain on until the battery goes flat. To force the controller to go to sleep, hold the PS button for 10 seconds. Once the light bar turns off, the controller is asleep. Shutting down your Pi will also turn the controller off. The light bar will turn on. The controller will automatically re-connect to anything it's already been paired to. The light bar will pulse yellow while charging, and turn off when fully charged. The Dualshock 4 can charge off either a USB host or a USB charger. It does not need to be connected to a USB host like the Dualshock 3 did. Just plug the USB-A into the Raspberry Pi and the Micro USB into the controller. Done. The light bar will glow dull blue when the controller is in use as a USB device this way. 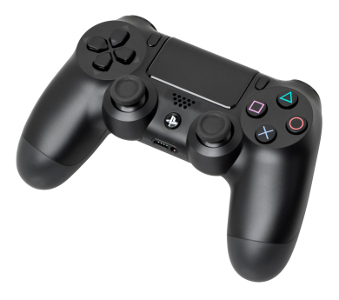 If you are concerned about power usage, charging the Dualshock battery can use up to 500mA of power. This add-on product made by Sony does the Bluetooth pairing in hardware. To the Raspberry Pi and RetroPie, the controller appears as a regular wired USB controller and no additional software setup is required. One adapter can pair one controller, though multiple adapters can be plugged into the one Pi to allow use of multiple controllers. Repeat with additional adapters and controllers as required. Not all PS4 controllers can be used this way!!! Try yours and see how it goes. If it doesn't work, then proceed to the next heading about ds4drv. Once paired, see if EmulationStation will recognise the controller. If EmulationStation does respond to button presses, lucky you, you're done. If EmulationStation doesn't respond to button presses, then your controller cannot be used this way. Unpair it and use the ds4drv method. The reason why all controllers don't work like this is not clear but controller firmware is suspected to be the reason - with "old" firmware able to be used as a regular Bluetooth controller and "new" firmware not able to be used this way - however it may also be some other non-obvious reason. If firmware is the reason, it's likely that System Software 3.50 (April 6th 2016) is the changeover, although it may be an even earlier update. ds4drv is a userspace driver which allows the Dualshock 4 to be used when regular Bluetooth does not work. Put the controller into pairing mode with Share and PS. It should connect to ds4drv within a few seconds. Once you have confirmed the controller connects, exit ds4drv with Ctrl+c, the controller will disconnect. Save this file and quit the text editor. Turn the controller off by holding the PS button for 10 seconds until the light bar turns off. Once RetroPie reboots and is at the EmulationStation screen saying "No controllers are detected", put the controller into pairing mode with Share and PS. The controller should connect to the ds4drv running in the background. If EmulationStation does not recognise the newly-paired controller, then press F4 to quit EmulationStation and run emulationstation to restart it, or just reboot your Pi and tap the PS button every few seconds to encourage the controller to re-connect to the ds4drv instance as soon as it runs. Once EmulationStation recognises the controller, proceed with the usual EmulationStation input setup.